For quite some time, Allison and I have really wanted a home climbing wall and climbing training area. The problem is, we live in a unit that's part of a quadraplex so we don't have a garage and space is limited. Our first iteration was a build of a small free-standing campus board with removable hangboard that I built in March 2015 in one of our spare bedrooms. While this worked pretty well for Allison, I'm 6'5" so I couldn't campus on it. I was finally able to do hangboard workouts, though, because it did have a pulley system for taking weight off so it certainly did serve a purpose. It was really nice to actually be able to do some home training. But in August 2016 we got a bit more serious and decided to have a shed built with the sole purpose of building a small climbing wall in it. We measured our back yard area and determined we could barely fit a 10'x12' shed in the area. That's pretty tiny as far as climbing wall areas are concerned. We knew we wouldn't be able to have a multiple-angles climbing wall in that space. It would have to be a single wall with a single angle. We had seen some information about the Moonboard and decided that would give us the most efficient use of the space. For those not familiar with the Moonboard, you clearly haven't been looking at climbing-related posts on Instagram recently. Shortly after we built our Moonboard in October 2016, they seemingly blew up in the United States and on Instagram despite being around for ages. We'll take credit for the explosion in popularity! Certainly it seems there's some animosity towards the Moonboard and its popularity, for whatever reason, but for maximizing training in a small space, we felt this couldn't be beat. 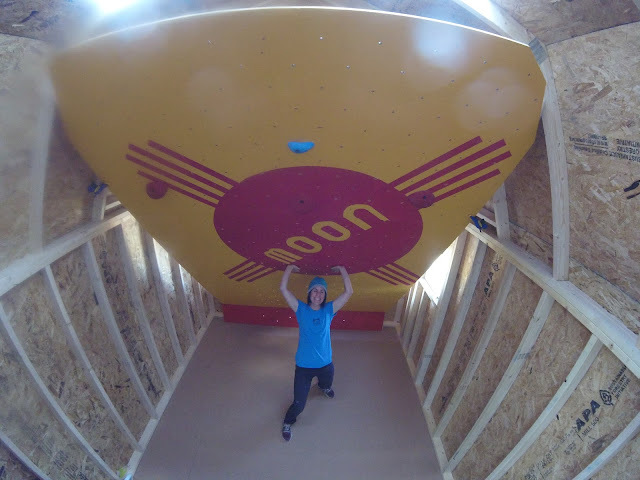 To summarize the Moonboard, it's an 8' wide by 12' tall, 40 degree-overhanging wall with three hold sets set in a precise location and orientation allowing users from all over the world to climb the same problems and share them via the Moonboard app. Moon Climbing makes the build specs and instructions available for download from its site. The Moonboard fits in our 10'x12' shed without losing any holds. The fit is tight but it works. The caveat is, though, we can't really go for dynamic top out moves for fear of kicking the walls or flying off into the back wall--so we don't do that. I knew if I decided to build the shed myself it would take months and likely not come out perfect. Therefore, we decided to bite the bullet and pay for a high quality Tuff Shed Sundance TB-700 build installed by Tuff Shed. This way we'd get a quality shed and it would be built on-site in one day. The TB-700 is a tall barn style shed. Googling the TB-700 doesn't yield a lot because the TB-700 is proprietary to Home Depot, apparently. 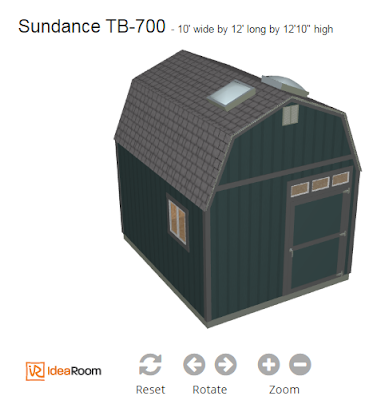 The TB-700 doesn't show up on Tuff Shed's site but you can configure a custom TB-700 shed at www.888tuffshed.com and then order it through Home Depot. We wanted the TB-700 because it has seven-foot sidewalls and a maximum height of 12'10"--just tall enough for a full-size Moonboard. We also configured our shed with a centered back door so we could access the area behind the Moonboard and use it for storage. There's quite a bit of room back there on account of the 40 degree angle of the Moonboard. We haven't insulated the shed and I don't think we will because the exposed frame makes it feel just a bit more spacious in there. That said, we haven't used it in summer yet and the heat may necessitate some foam insulation to keep it a bit cooler in there. We've been heating the shed in winter with a Mr. Heater propane tank heater and it's worked out well. Also, so long as the sun is out and hits it for a few hours during the day, it warms up quickly in there. 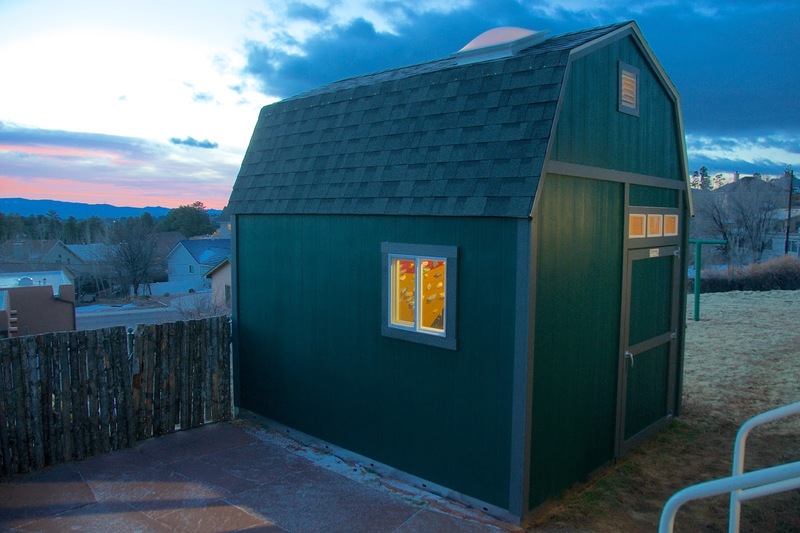 We did apply for, and obtain, a Los Alamos County Small Shed (120 sq. feet or less) permit. 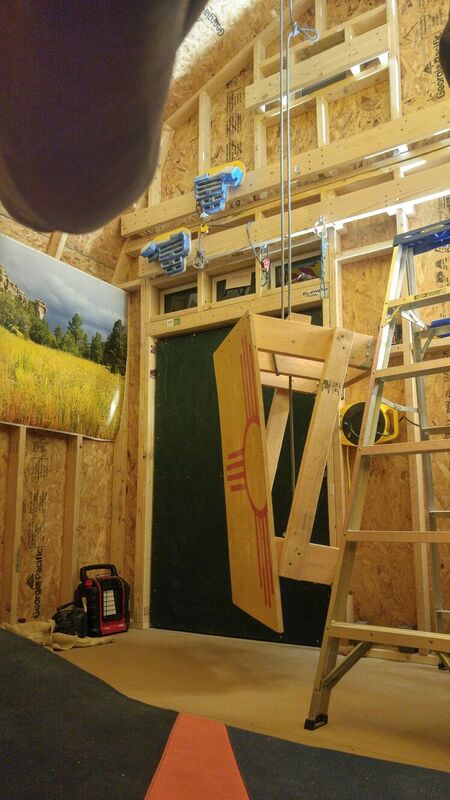 Also, because of the 12'10" height, we had to obtain a Minor Dimensional Deviation From the Code permit since the standard max height in Los Alamos County is 12'. While a somewhat onerous process, it was, in the end, relatively easy with no challenges or difficulties. We prepped the area in our backyard by clearing the area and getting it level within four inches (the installers can use shims to get it level within that four inch tolerance.) We did our best to have a two-foot clearing around all sides, as stated by Tuff Shed, but the only area we had for the shed has a chainlink fence on one side and we needed the shed to be built right up against that fence in order for it to fit. On installation day, I quickly removed the chainlink fence fabric and the installers did a fantastic job of getting the shed built right up to the fence posts. The installers came in on October 6th, 2016 and cranked out the installation in one long 9-hour day. It was amazing to watch the skill and experience at work. We've run an extension cord out to the shed to a five-outlet power puck, with USB ports, and run a single 40W, 3000 lumen LED shop light (mounted to front wall) which is plenty of light in the space. 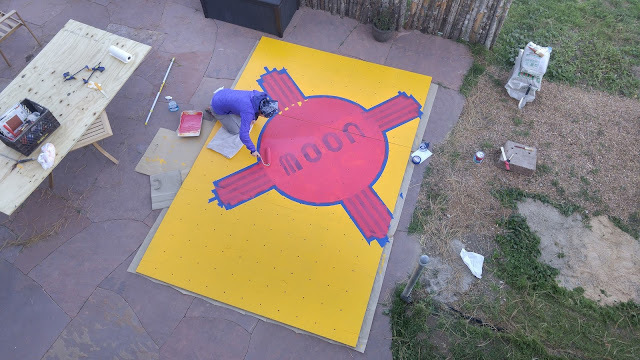 Painting the Moonboard. The area to the right of the board is where the shed was placed. The post from the old chainlink fence (seen bottom center) had to be removed before the shed was installed. With the shed built, I had a blank canvas inside and three days over the Columbus Day holiday weekend to build the Moonboard. I had ideas in my mind on how I'd do it but truth be told I winged it A LOT and did a lot of engineering-on-the-fly. This means I don't have build plans I can share with you but this time lapse video of me building it should give you an idea of how it went up. I did build shelves in the back with an access hole from the back door up to the shelves. In three days, with multiple trips to the lumber and hardware stores, the Swole Hole was born! 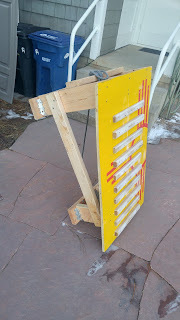 Because we wanted to be able to do more than just power workouts on the Moonboard, we looked for ideas to add more holds to a typical Moonboard t-nut grid of 6x11 per sheet of plywood. 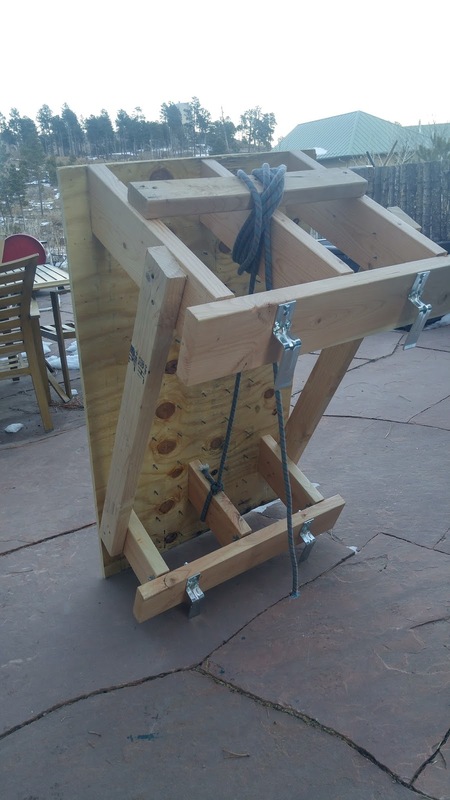 I happened upon this blog post showing a build that added an additional 5x12 grid per sheet of plywood adding 180 t-nuts to the Moonboard's standard 198 t-nuts for a grand total of 378 t-nuts. Lots of additional potential hold locations! Therefore, in addition to the three Moonboard hold sets, we purchased a bunch of holds by Atomik, including some jugs, to add many more options to our board. The additional holds have allowed us to work power endurance and endurance doing some ~30 move circuits on holds that are a lot more generous than most Moonboard holds. For the floor, we have four bouldering pads with an Organic blubber pad over the gaps between the pads. On the front wall above the front door, I've added three 2"x6" horizontal supports across the length of the wall to allow us to hang our hangboard and a removable campus board on. 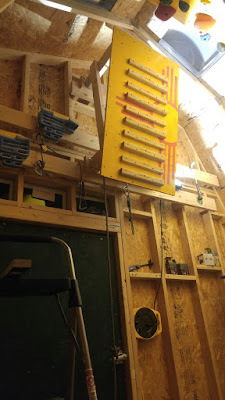 The hangboard is a Trango Rock Prodigy Training Center (RPTC) board setup as removable/adjustable along with a pulley system for taking weight off the climber. I used the RPTC Adjustable Mount 2.0 idea to make the RPTC adjustable and removable. This has been great because it allows both my wife and I to use the same board but adjust it easily for our different body sizes. I've also built a removable campus board. The board has two sets of campus rungs on it--medium and large. It's a bit overbuilt and heavy (weighs 67 pounds.) It requires two people and a pulley to put up/take down (plus space to store it when not in use.) It's built upon the same idea of the RPTC removable/adjustable mounts using the same door stop hardware for hanging it up on the 2"x6" supports I put up on the wall. I'd like to whittle down the weight and will see about removing the angled side supports to see how it feels without them. But once in place, it's very solid and effective. Due to space constraints the bottom of the board only juts out from the wall about 16" so you gotta keep your swinging knees in check while getting after it. Removable campus board in place with rungs screwed onto board. Two sets of rungs--Metolius medium and large rungs--eight inches apart.